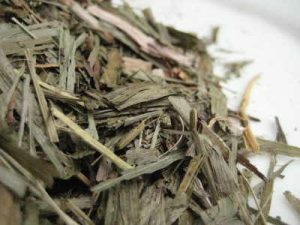 Artemisia pontica, the Roman Wormwood or Small Absinthe, is a lesser known cousin of Grand Wormwood and the preferred herb used in the production of absinthe and vermouth. Originating in southeastern Europe (the specific name refers to the Pontus area on the shores of the Black Sea). 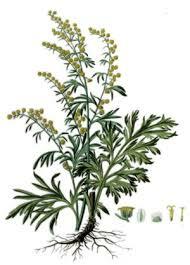 The essential oil from the plant contains cineol, camphor, thujone, and borneol among other components. 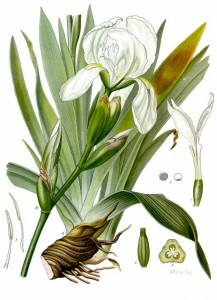 It is said to be less bitter than great absinthe and is the principal flavouring of vermouth. 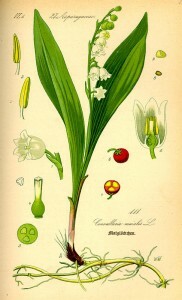 It is commercially cultivated in Spain and Lithuania. 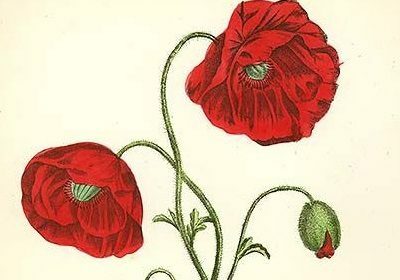 The flowers of the corn poppy have a very long tradition of medicinal usage, especially for ailments in the elderly and young children. 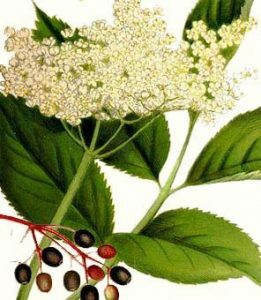 They are mainly regarded (in syrup) as a mild pain reliever and as a treatment for irritable coughs but also help to reduce children’s nervous over-activity. Unlike the related opium poppy (Papaver somniferum) they are non-addictive. 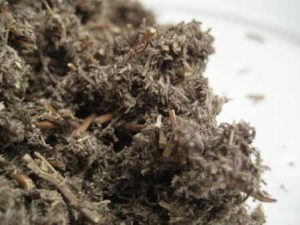 However, the plant does contain alkaloids, which are still under investigation, regarded as very very slightly narcotic and so should only be used under the supervision of a qualified herbalist. The flowers and petals are anodyne, emollient, emmenagogue, expectorant, hypnotic, slightly narcotic and sedative. 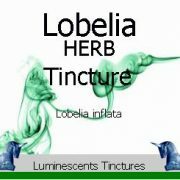 An infusion is usually taken internally in the treatment of bronchial complaints and coughs, insomnia, poor digestion, nervous digestive disorders and minor painful conditions. 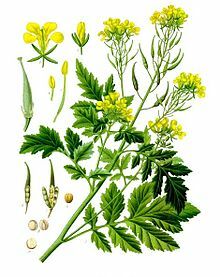 The flowers are also used in the treatment of jaundice. The petals are harvested as the flowers open and are dried for later use. They should be collected on a dry day and can be dried or more frequently made into a syrup. The latex in the seedpods is narcotic and slightly sedative. 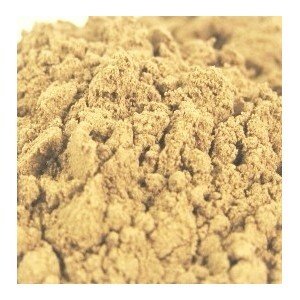 It can be used in very small quantities, and under expert supervision, as a sleep-inducing drug. The leaves and seeds are tonic. They are useful in the treatment of low fevers. 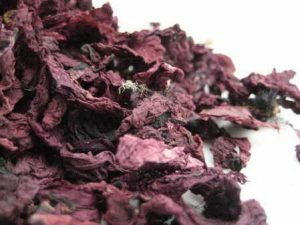 They are frequently used in Pot Pourri simply because they are pretty and keep their colour well when dried properly. Papaver Rhoeas is very slightly narcotic. 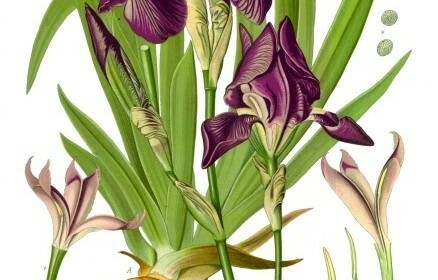 The chief constituent of the fresh petals is the red colouring matter, which consists of Rhoeadic and Papaveric acids. This colour is much darkened by alkalis. 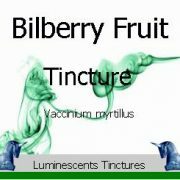 All parts of the plant contain the crystalline non-poisonous alkaloid Rhoeadine. The amount of active ingredients is very small and rather uncertain in quantity. There is great controversy as to the presence of Morphine. Also it has not been determined whether Meconic Acid, which is present in opium, is a constituent. 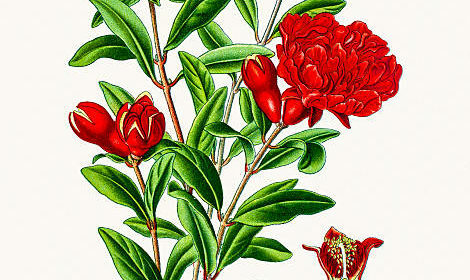 Pomegranate Flowers (Punica granatum) can have a beneficial effect for overall general health. The tree will bloom abundantly although little blossom will set fruit in cooler climes and blossom fall is common, however the flowers are generally sun dried and then the blossoms can used to make a herbal tea. A tea made from the flowers is generally believed to be beneficial for specific cardiac health, to reduce the symptoms of diabetes and good for general health. The flowers have astringent effects and can be used to help prevent acne. A toner or face pack made using the flowers is excellent for skin health. 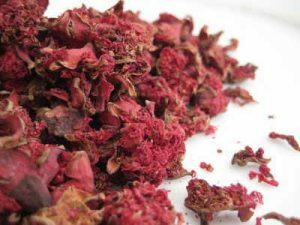 Dried pomegranate flower (when powdered) can be used in the preparation of a herbal tooth powder. The flowers can treat gingivitis and are good for overall oral health. Used to help relieve the discomfort of migraines and minor headaches. In other cultures it is known by a variety of names such as Granada or Granado, Dulim, Dadima, Granatapfel, Melegrano or Pomo Granato. The tree is native of the Middle East stretching to the Himalayas in northern India and has been cultivated since ancient times throughout the Mediterranean region of Asia, Africa and Europe. The fruit was used in many ways as it is today and was featured in Egyptian mythology and art and was prized in the ancient world. It was known to central and southern India where it was brought from the Middle East about the first century A.D. and was reportedly growing in Indonesia in 1416. It has been widely cultivated throughout India and drier parts of southeast Asia, Malaysia, the East Indies and tropical Africa since. The most important growing regions today are Egypt, China, Afghanistan, Pakistan, Bangladesh, Iran, Iraq, India, Burma and Saudi Arabia. There are some commercial orchards in Israel on the coastal plain and in the Jordan Valley. 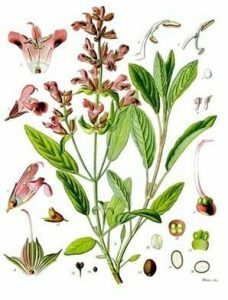 It is rather commonly planted and has become naturalized in Bermuda where it was first recorded in 1621, but only occasionally seen in the Bahamas, West Indies and warm areas of South and Central America. Many people grow it at cool altitudes in the interior of Honduras. In Mexico it is frequently planted, and it is sometimes found in gardens in Hawaii. The tree was introduced to California by Spanish settlers in 1769. It is grown for its fruit mostly in the dry zones of that state and Arizona. In California, commercial pomegranate cultivation is concentrated in Tulare, Fresno and Kern counties, with small farms in Imperial and Riverside counties. Images of the fruit are used to represent fertility, which seems to have its origins everywhere. We see it in the Middle East and India. The fruit was cultivated in Egypt before the time of Moses. It was found in the Indus valley so early that there is a word in Sanskrit for pomegranate. Indian royalty began their banquets with pomegranate, grape, and jujube. Arab caravans probably spread its use. 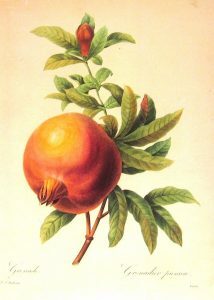 The pomegranate is significant in Jewish custom. Tradition holds that a pomegranate has 613 seeds to represent the 613 commandments in the Torah. The design of the pomegranate was woven into the high priest’s robes, and brass representations were part of the Temple’s pillars. It is mentioned six times in the Song of Solomon. We see it again in ancient Greece and Rome. In the verses of the Odyssey, Homer mentions it as part of the gardens of Alcinous (probably in Sicily). The Romans imported their pomegranates from African Libya, and Pliny the Elder gave instructions for its storage. It appears in China during the Han and Sung dynasties. The derivation of the word pomegranate comes from the Middle French pome garnete (seeded apple), but Europeans were slow to adopt the pomegranate. 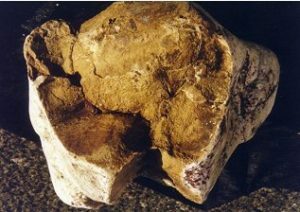 It was probably introduced from Sicily, however Europeans, then under Norman influence, distrusted fruits and vegetables, preferring a meat-based diet. It is mentioned in the 14th century Ménagier de Paris which offered some recipes, and it was known in England in Elizabethan times being mentioned in Shakespeare’s Romeo and Juliet. The enthusiasm for pomegranate as a food was limited, but it was widely used as a decoration. The Spanish Conquistadores brought the pomegranate to America. Jesuit missionaries carried it north to their missions in California. They were found growing wild in Georgia in 1772 . The word Attar is derived from the Hindu/Urdu word Ittar which in turn derives from the similar Persian word for Perfume, Itar, and is an essential oil derived from botanical sources usually blended with a wood oil like, but not always, Sandalwood. 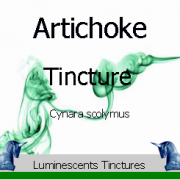 Most commonly these oils are extracted via hydro or steam distillation. 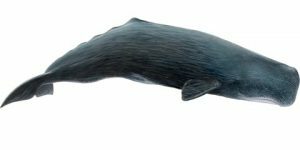 They can also be expressed by chemical means but generally natural perfumes which qualify as Attars are distilled with water. The term is mostly used in the Middle East and India nowadays instead of the term essential oils but historically an Attar was very different. Attar oils were once generally distilled into a wood based oil such as sandalwood and then aged. 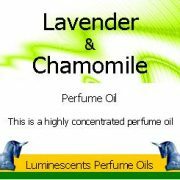 By and large they still are.They are extremely strong in aromatic terms and a little (just a drop) can be overpowering. Their use is popular in the middle and far east particularly as they are alcohol free but they should be used sparingly and with circumspection. 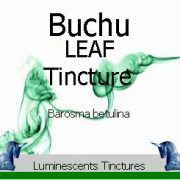 The aging process could last from one to ten years depending on the botanicals used and the results desired. Technically Attars are distillates of flowers, herbs, spices and other natural materials. As they age they thicken and become strong. Their expense is down to the use of Sandalwood or other expensive or endangered wood oils let alone the additional distilled ingredients like oud which is the most expensive wood in the world or Rose which takes at least 9000 petals to make just 1ml of oil. The ancient Egyptians were famous for producing perfumes or Attars throughout the ancient world and they are still renowned in the field today. The perfumes were extracted from plants and flowers by a process that we, today, would call “enfleurage” before they could be added to other oils. The process was later refined by the famous Muslim physician Shaykh al-Rais who made a distinctive type of distilled aromatic product. He was referred to as Abi Ali al Sina. Some say that he was the first to make a distillation of Rose. Liquid perfumes were previously just a mixture of oil with crushed herbs and aromatics until his distillation process where he is said to have first experimented with roses. The most famous Attars of his day were Rose, Saffron, Jasmine, Oud and at the time were greatly favoured by the Islamic world to treat numerous health disorders largely. 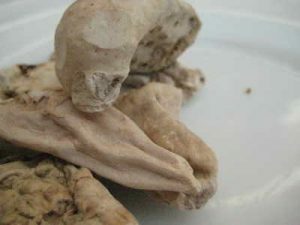 They are still popular today along with a variety of musks but are more highly regarded for their aromatics qualities than their medicinal attributes. Some of the first users of Attars were the Mughal invaders of India from Persia. 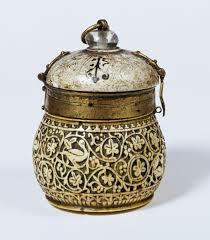 Jasmine Attar was the favourite perfume of the Nizams of the Hyderabad state. Traditionally in the Eastern world, it was a customary practice for the nobility to offer an Attar to their guests at the time of their departure. 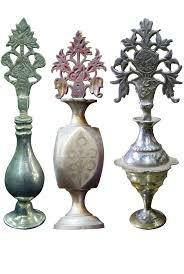 The Attars are traditionally given in ornate tiny crystal cut bottles called Itardans. This tradition of giving a scent to one’s guests continues to this day in many parts of the Eastern world. Among Sufi worshipers the use of Ittars during meditation circles and dances is quite common.